This beautiful and fully restored 100-year-old farmhouse, built by one of the original pioneers in the Wenatchee Valley, is situated on 20 private acres in Brender Canyon, about 15 minutes from Leavenworth. With over 3,000 sq. ft. & 3 full stories, the farmhouse includes a huge stone wood-burning fireplace, new furniture, carpet, lighting, hardwood floors, new bathrooms and fixtures, beamed ceilings, antique furniture and period pieces throughout. There is a 10-foot dining room table that seats up to 18 guests handmade from the 100-year wood made available during the restoration. Five full bedrooms and a charming fully-screened sleeping porch sleeps 16 comfortably. The former attic was completely remodeled into a modern game room & den complete with large screen TV, ping pong table, game tables, 3 twin beds, a hide-a-bed and 2 large couches. New carpet, vaulted ceilings and ceiling fan plus beautiful lighting is throughout. The real charm from this historical property is in the land and surrounding vineyard, orchards, huge Black Walnut trees, flower gardens, pristine hills for hiking. These 20 acres adjoin Forest Service Land for a peaceful setting with elk, deer, and other wild animals always close at hand. This is the perfect family getaway for a weekend or a week with Leavenworth so close, the Columbia River for boating, and quaint & quiet Cashmere with its parks, Pioneer museum, Aplets & Cotlets store, wineries, bakeries, restaurants, bowling alley, and huge antique market places. The Wenatchee River is nearby for summer floating. Please note: Friendly dogs are permitted as long as they are not left alone inside the house or allowed on the furniture. Wild alcohol or questionable parties are NOT permitted. Five car parking limit without prior permission. No camping, RV's, snowmobiles or ATV's are allowed. Event fees (with prior permission) may apply for groups with attendees not included in farmhouse overnight charges. Our busy family of five includes three college-age sons. We own and have operated a fine-dining restaurant in Seattle, where we permanently live, for over 24 years. And also own the Warm Springs Inn as of 8/13 (B&B and event venue) on the Wenatchee River nearby. Chef Ludger (& owner) was born and raised in Germany, so he naturally gravitated to the 'Bavarian beauty' and pioneer history of this old house. Julie Szmania was born & raised in Seattle, but travelled the world enough to recognize the beauty here. I'm a UW Husky, one son is a WSU graduate, and two are WWU Vikings. Plus our 2 great dogs love the farm and vineyard which we planted as a family in 2008. We now have private label Brender Canyon Vineyard Red Field Blend available for sale. Cashmere is like a dream come true in that is combines the beauty of all 4 seasons within 2 1/2 hours of Seattle. The Wenatchee River is close for tubing, the Columbia River is close for water sports and fishing. The mountains are close for skiing and we have hot enough weather to grow our own vineyard. This house is huge enough to have lots of families share it at one time without feeling crowded ever. Our kids love the 3rd floor game loft especially. We use our mountain & road bikes, as there are many hiking and horse trails. Plus 300 days of sunshine guaranteed in Cashmere is great & it's in the heart of Chelan Co. wine country. We liked the peace and privacy of acreage and our sons love all the activities surrounding the area. The wild animals are wonderful - as long as they stay out of the vineyard. Herds of elk and deer roam the property, plus the occasional coyotes howl. We've seen a bear and a mountain lion, tons of hummingbirds and song birds. The spring peonies are gorgeous, fruit trees and orchards are everywhere, the house is surrounded by 100+ foot tall old Black Walnut trees for shade and sheer beauty. There's lots of grass to play croquet or badmitten, slip & slide or throw a frisbee. Plus we have several friendly hens in summer and fall for farm fresh eggs daily. We treat this as our home to share with friends so it comes fully stocked with everything we could think of that you might enjoy including cords of firewood, toys, books, movies, games, puzzles and kitchen items. A Wi-Fi hotspot is not on site if you really want to work during your stay! Orchard country with horses next door, cherry trees up the canyon and pears everywhere. 3 mile country road from 'downtown' Cashmere, past old farms and many active orchards. Farm is nestled in a quiet Canyon, forest views, 1 acre grape vineyard, and the lush landscape of E Cascade slope. Old growth shade trees, huge tall Black Walnut, Ash, Evergreens, flower gardens. For up to five cars - please let us know if you need more space. Giant sectional couch in front of fireplace and TV movie watching area. Big picture windows. Additional seating area with couch, red leather chairs, rockers, Next to dining area. A full country kitchen complete with all pots, pans, utensils, Martha Stewart and German-made china place settings for 30, glasses, wine glasses, silverware for 30, baking dishes, table linens, double electric oven. Fully stocked with spices and the basics. Dining table in kitchen seats 8. Dining table in dining room seats up to 18. Huge wooden hand-crafted table is made from the extra ceiling beams when the 3rd floor attic space was remodeled, Both bench and chair seating - up to 18. Hook up your iPad for music on a small speaker system in the living room. Many wonderful books about the region and history of Cashmere, Leavenworth, Pioneers and Wenatchee/Columbia River. Legos, Lincoln Logs, small toys and puzzles--and many game tables. over 100 current movies and DVD's available. DVD's are connected to the main Living Room television and also the top floor den television. Ranging from PG cartoons to R classics for family viewing of all ages. front deck is above ground and runs the entire length of the house. A full wraparound deck is on the front of the house with glass French doors opening to the dining/living room. Also a back patio features an outdoor fire pit with roasting sticks; seating & camping chairs supplied. There is a flat entrance into the house but it is not ADA certified. Wheelchairs will need some help. Working vineyard with Syrah, Sangiovese & Merlot grapes. 20 acres of ground to hike, sled, snowshoe or cross country ski. Great time in the snow! We had a wonderful time at the farmhouse! The large property is nestled under a hill that is perfect for snowshoeing and sledding in the snow and there are a large selection of games/puzzles/books available to guests; our favorite game was the ping pong table. Julie and Ethan were accommodating hosts and everything we needed for the weekend was stocked in the house. Highly recommend for a winter getaway! Really comfortable charming and special. Perfect for extended family with lots of kids. We had our own private sledding hill! Thanks for the nice review - so glad you all had plenty of snow and the kids were happy with the sledding. It's still snowing over here and not sure when it's going to end. Good for skiing and playing. Please come stay with us again as Brender Canyon is lovely in every season, especially fun in summer for hiking, biking and river floating. Thank you again for staying at the farm. This was a great spot for a large group. The big open living and dining room were perfect for hanging out and having five bedrooms meant everyone go their own space! Thank you Misha! We are glad you had plenty of room and hopefully enjoyed all that fresh snow while you were at the farm. Please come see us again - every season offers a new experience in Brender Canyon. Thanks again for staying at the farm. We loved the farm house! There was so much room for all of us. The house had a lot of charm. I gave a four star for some cleanilyness issues and the beds being a little uncomfortable. But it was overall a great place! Our family gathered from all over the country for a lovely reunion at the old farmhouse. We enjoyed wonderful skiing at both Steven’s Pass and Mission Ridge, beautiful snowshoeing at Blewett Pass, and a festive early evening in Leavenworth. Cashmere was great for supplies and lunch out. The farmhouse had ample sleeping space for ten, plenty of room to spread out during the day, and a wonderful, long table for dinners all together and puzzles & games after. We all left with lasting memories of the snowy, dormant vineyard, the sounds of softly clucking chickens, and the warmth of family gathered together by a wood stove . Thank you so much Emily! You clearly felt the essence of a Christmas holiday at a wonderful old farmhouse. I can only imagine the 90 years of Christmas' past from the old Brender family. Your being able to ski and snowshoe really utilized winter in this great region. Thanks for being so kind to our home and we are grateful for your time there. Glad you enjoyed some of our Brender Canyon Wine as well (we got the check today!). Happy New Year!! Perfect spot for a family time away from home. We wanted to visit Leavenworth for the Holiday Lights with a few family/friends and picked this house for its size compatible to our group size. While it already looked pretty great in pictures and descriptions, we were in for a very huge surprise as it exceeded our expectations. There was plenty of room for our party and (more than) enough towels etc. for use as well as there were supplies we don't find in many vacation homes. Even the kids could have separate room (or rather floor) for a fun sleep over together in the attic with the toys and games. The snow on the hill next to the house gave us opportunity to use our sleds to slide down and everyone enjoyed it a lot without going or driving anywhere with all the stuff. The snow prevented us from exploring more but the surrounding area could be a fun hike on a nice sunny day as well so it is a good spot for all seasons. Leavenworth is not too much of a drive from there and this quite house is close enough and far from the crowded town at this time of the year so you get peace and quite as well as quick access to the tourist attractions. Only downside was the water with the odor of sulfur which probably is due to it being well water and not much can be done about it. But the host has a water cooler stocked with bottles of water to be used for drinking/cooking. In all we may even consider going back again to same home in future if we need it for similar size groups. 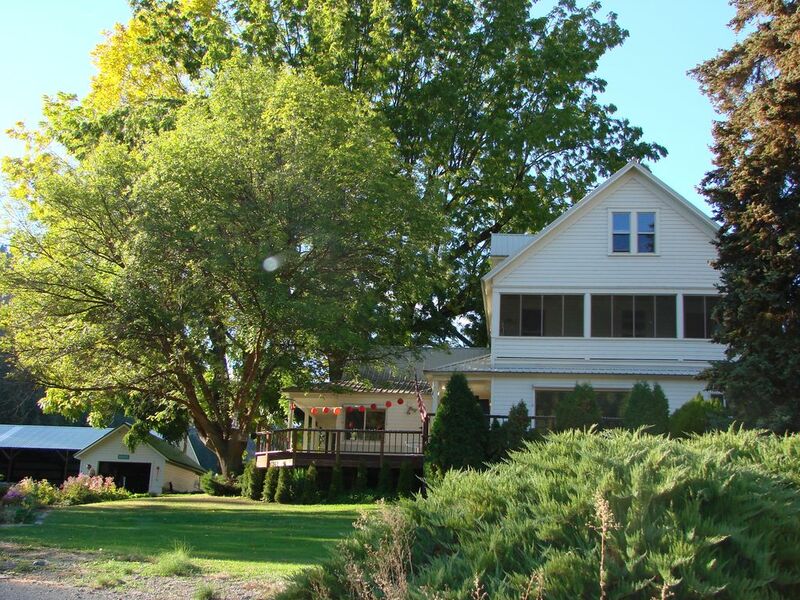 1 acre vineyard, 20 acres of pasture and woods, easy hiking, horse trails, badmitten, croquet, outdoor fire pit, river tubing in summer, all water sports on the nearby Columbia river. NO HUNTING. Rates are subject to change until confirmed. Holiday pricing differs depending on dates, so contact us directly for quotes. Min.nights required may vary depending on holiday. No camping, RV's, snowmobiles or ATV's. Parking is limited to 5 cars without prior permission. Event charges may apply for guests on property who are not staying overnight & included in fees. Capacity limits apply.